Mala Pier is without a doubt one of the top if not the top shore dive on Maui. This is especially true of the available sites on the leeward side of the island near Kaanapali. The pier is in the middle of Lahina near the Canary Mall. When you are driving along the highway from Kaanapali back towards Kahului you can see the pier on the right just as you start into Lahina. Mala Pier is an extremely easy boat dive and a moderately easy shore dive (the only difficulty is the entry if you go over the reef on the side of the pier). The dive itself is between 15 to 35 feet and you can spend well over an hour assuming you have reasonable air consumption. Mala Pier is loaded with all kinds of schooling fish, Green Sea Turtles and Hawksbill Turtles, White-tip Reef Sharks, lots of Butterflyfishes, and much more making it an excellent site for underwater photography. Mala pier was built in the early 1900’s by the Dole Pineapple company to be able to offload pineapples from Lanai. They would then have them processed at the Pineapple Cannery in Lahina which is now the Cannery Mall. Mala pier, for a variety of reasons, was never used by the Dole Company but did see service in WWII for loading and unloading supplies. The concrete pier stood until 1992 when it was destroyed in hurricane Iniki. 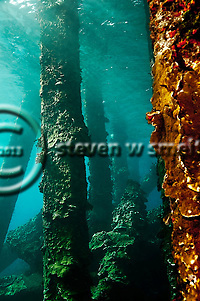 However, the destruction of the pier has been a boon for scuba divers in Maui. Mala Pier makes a great morning or afternoon dive and is spectacular as a night dive. However, I would highly recommend that you dive the site first during the day before attempting a night dive. Visibility is usually quite good, from 40 feet and up. There is no current to speak of and the site is quite easy to navigate. You swim out following the remains of the pier and then turn around and follow them back to shore. No worries, very easy navigation. There are also a few coral mounds in the sand surrounding the pier which are also quite interesting and make for great macro photography. But you should be a reasonable navigator to investigate these additional sites. If you enter Mala Pier from the beach, on the west side, it is best done when there is a high tide. You will have to cross a very shallow reef and will most likely have to walk part of the way out over the coral. If you choose this entry I would suggest that you float your gear and not put on your fins or BC until you reach deeper water. Please check the local tides with Google or go to tides.info and search for tidal information for Lahina before your dive. However, I would highly recommend entering Mala PIer via the small beach to the east of the boat ramp. This is a very easy entry and a requires a relatively easy 10 minute swim around to the pier in calm water. Once you enter the site you will quickly get to about 15 feet of water and can begin your dive. You will notice many Keetail Needlefish around the standing and fallen columns of the pier. You will also see a number of juvenile fish of a variety of species in this same area. As you move further along the pier you will encounter a wide variety of corals attached to the pier and a number of different types of Butterflyfishes, Bird Wrasses, Goatfishes, Green Sea Turtles and much more. If you are looking for sharks you can almost guarantee that you will see several White-tip reef sharks on this dive. There is usually one or more resting under the fallen columns towards the far end of the pier. You will also see sharks resting on the bottom typically on the western side of the pier usually mid-way down to pier to the end of the pier. You can also encounter these sharks as they are cruising around the ruble in search of the next meal. Don’t worry they won’t bother divers unless they are significantly provoked. So approach slowly and then take the time to appreciate these marvelous creatures. This is a great dive site. Take your time to truly appreciate it. If you need to rent tanks check out Lahina Divers, they are my favorite dive operation on Maui, but you can also rent from a number of other locations. You can see the complete photo gallery for Mala Pier at stevenwsmeltzer.com as well as more on underwater photography and landscape photography or you can follow me on Twitter at Images2Inspire.